Wine and cheese make the perfect pair. This guide will help you with the best way to mix and match two of life’s greatest culinary pleasures. 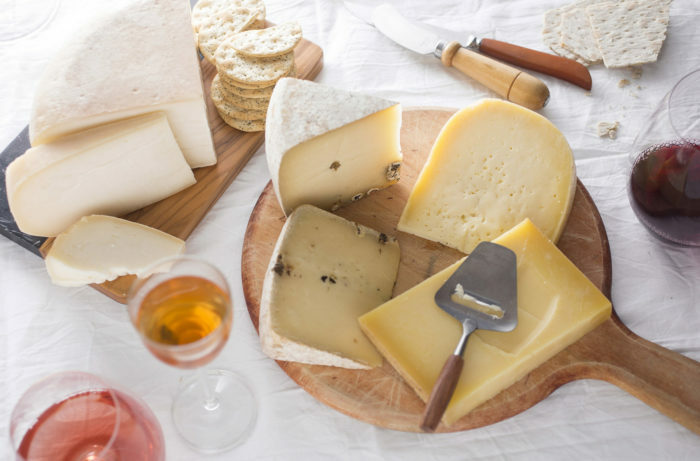 Wine and cheese are two of life’s great culinary pleasures, and finding the perfect match can be a delicious endeavor. As with any wine and food pairing, there are a number of considerations, such as texture, acidity, fat and tannin. Rather than complicating the topic with exotic matches like Garrotxa and Meursault, we’ve broken the art of wine and cheese pairing down, so you can create your own. Wine and cheese pairing possibilities are endless. To simplify the strategy, cheeses can be divided into six categories. Fresh: Soft and rindless, these can be made with cow, goat or sheep milk. They’re not aged and have a mild, slightly tangy flavor. While a log of bright white goat cheese is iconic, the category also includes farmer’s cheese, ricotta and others that come in tubs. Bloomy: These are named for the bloom of white mold on the outside. They tend to be the richest and creamiest type of cheese, with a soft, spreadable texture. The rind is edible, and it has a stronger, funkier flavor than the interior. Washed Rind: A bath in brine, beer or wine produces a distinct orange rind. They’re rich and creamy, and they can be soft or semi-soft in texture. They’re funkier than bloomy cheeses, with gamy, often pleasantly pungent notes. Semi-Soft: They’re not spreadable, nor do they break in shards like a hard cheese. They tend to be creamy and fairly mild in flavor. Many are excellent to melt and perfect to slice. Some cheeses like Gouda are semi-soft in younger styles, while when aged, their texture turns hard. Hard: The product of aging, these are quite firm and break into crumbles or shards. They tend to have nutty and complex savory notes. Some are fairly pungent and salty. Blue: Veins of blue mold run through these. They can be soft and creamy, or semi-soft and crumbly. Some are sweeter and milder, but all pack a good deal of sharpness and tang. Mozzarella: Although not creamy or soft, it’s best consumed quickly after production for a sweet, grassy creaminess and semi-soft texture. Burrata: A mozzarella exterior gives way to a luscious, milky center of mozzarella scraps mixed with cream. Chèvre (goat): This spreadable, crumbly cheese has a pleasant tang and a rich, dense texture. Feta: Brine-cured feta is tangy and assertive in its saltiness. It should have a foundation of creamy and nutty flavors to back up its salt. Ricotta: This was born of thrift: Italian cheese makers didn’t want to waste whey from hard-cheese production, so they’d add it to milk. The result is sweet, creamy and mild. Brie: Ultra-creamy and buttery, with hints of fresh field mushroom. Camembert: Very creamy, but with more concentrated earthy flavors and pungency with age. Robiola: Often made with a mix of cow, sheep and goat milks, it’s mild and luscious, marked by tang and saltiness. Light-bodied, dry, unoaked Chardonnay (Chablis). Fontina: Rules dictate when cows can be milked for this cheese, which ensures enough creaminess to balance its funk. Epoisses: Despite a funky odor, this soft, rich cheese scoops like warm butter and has a delicious, tangy flavor. Reblochon: This raw-milk cheese has to be aged in cellars or caves in France’s Savoy Mountains. This provides a grassy, herbal tinge that complements its richness. Taleggio: One of the milder washed-rind cheeses. It has a dense, sticky texture, gentle yeast and grassy notes. Gruyère: Often seen melted atop French onion soup, it’s delicate, and offers notes of hazelnut and brown butter. Gouda: This offers mild, nutty flavors with a bit of tang, along with a rich, dense texture. Havarti: Creamy and buttery, it gets sharper and earthier with a bit of age. Cheddar: It’s bold and nutty, with a hint of sweetness. It gets crumbly, sharper and salty with age. Double Gloucester: Colored orange by annatto seeds, this has apricot and grass notes. Parmesan: This gets better with age, as its grassy, nutty and salty flavors intensify. Pecorino: Made from sheep milk, this has pronounced gamy flavors and tang, balanced by brown butter notes. Cambozola: Born in Germany, this combines Italian Gorgonzola with the French method of making a triple-crème cheese for an exceptionally mild, creamy delight. Danish Blue: Semi-soft and with a good deal of creaminess, this is one of the more pungent options. It delivers a sharp funk from beginning to end. Gorgonzola: Depending on age, this can be semi-soft or firm and crumbly. It possesses a sweet nuttiness and pronounced saltiness to balance out its funk. Roquefort: The culture used to produce this sheep-milk cheese is used in blues throughout the world. It’s a strong, salty cheese with a sharp bite and crumbly, semi-soft texture. Stilton: Dense and almost fudgy in texture, it has a distinct peppery sharpness in addition to the standard blue funk. Milder blue cheeses like Cambozola share the same potential matches as bloomy cheeses.